So the old story goes that the best time to plant a tree is 20 years ago. The next best time is today. This is true of almost all areas of our life. Let’s think through this in several examples. When’s the best time to get in fit and in shape? But what if we didn’t do that or if we have let ourselves go over the last few months or years or decades? Then today is the best day. Do what you know you need to do and if you have doubts, research and figure out your options. That’s what I had to do — and am doing now — after realizing that I let “life” get in the way and my health and fitness had declined. I can complain about how I wish I had never let that happen. Or that I had done XYZ when i was 16 or 26 or 36 or 46. When’s the best time to plan for retirement? Apparently when we were 7. If we saved one dollar at age 7, apparently we would have like ten million dollars now. OK, so maybe a bit of an exaggeration. But you’ve seen the charts that compare the twins — one saved from 18 to 25 and the other one from 25 to 65 and they end up with the same money supposedly. It is painful if you, like me, have not been saving since our first dollars earned. Well, we can complain about and “regret” all day long. But that doesn’t change the past. Start investing and saving now. The past is dead and gone. It only exists in our minds. What is real is right now. So let’s get busy right now. How about fixing credit report errors? When you need errors fixed, we all wish we had done it last year. Because when we need credit, it usually is pretty urgent. You know the drill — can’t change the past. So fix it right now. No use whining about I wish I had done this in the past — the present is all that I have so I need to focus on that. Any problem or opportunity — take action right now! Problems we wish we would have fixed in the past — fix them now. Opportunities we wish we had taken — take them now. 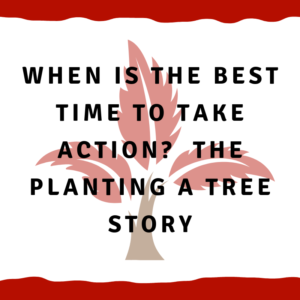 So that old story of the best time to plant a tree is really solid advice — do it now. Feel free to share your thoughts below in the comments or reach out to me directly.